EPBOT: November Art Roundup: Bookworm Dragons, Superhero Snowmen, & House Owls! And prints are only $5! Most of the originals are still available for $30, though, and as we all know, originals are better. Not to mention his adorable take on classic characters. Jason also has a bunch of new "desktop allies"
Anyhoo, go see the rest of the goodies (there are SO MANY) at the Red Rocket Farm store! And finally, my best accomplishment this month: I managed to sweet-talk another artist into offering prints for you guys! Yay! 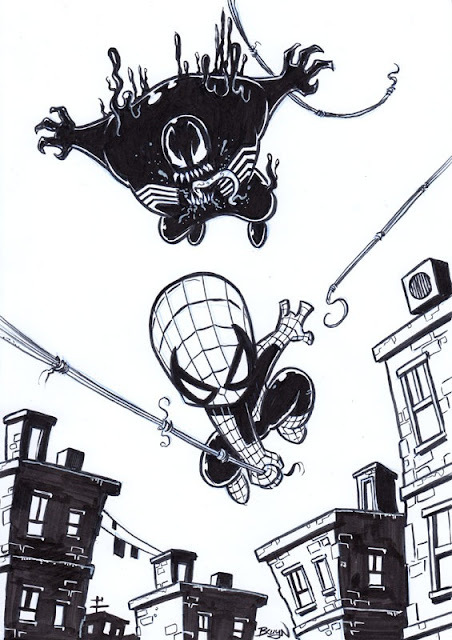 I've been harassing Dennis Hansbury for ages now, since he usually only sells originals. 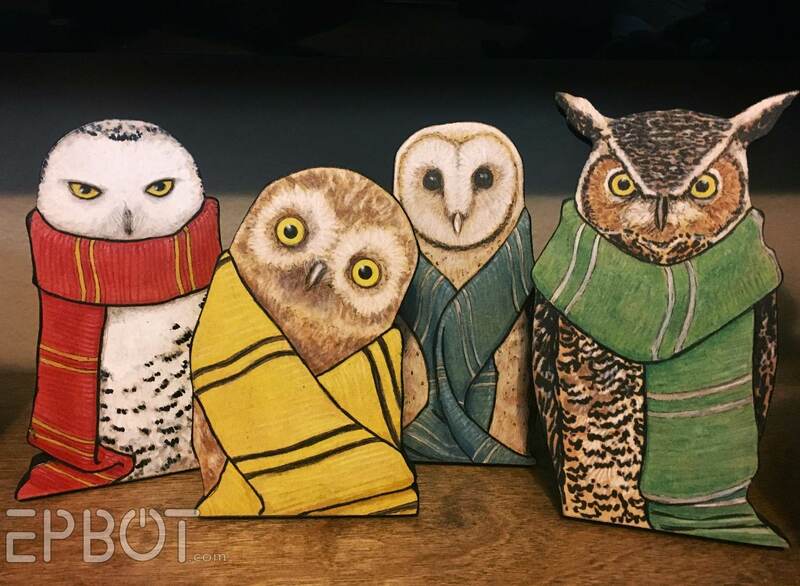 When John and I purchased his entire set of wood-stand Potter owls last month, though, I cranked the harassment up to 11. I knew you guys would like these! As in, the ink-is-probably-still-wet "just made." They're between 4 and 5 inches tall, like the originals, and look! 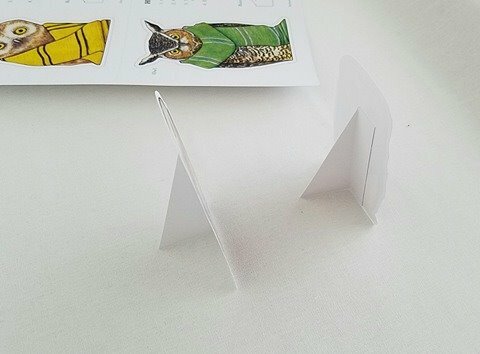 You cut them out and make your own stands! I love that they're small and don't need framing, so you can easily tuck them into a shelf or cubicle. Best part? They're only $6 each, or $20 for the set! Head to Dennis' Etsy shop to pick up your favorite(s). Btw, given how much cheer leading I do during my roundups, I feel I should clarify that I do NOT get paid for anything I feature here. I show you guys what *I* love and think you'll love, period. Now, let's give some stuff away! Comment below for a chance to win your choice of art from my Pinterest Art Give-Away Board. (Internationals welcome; I'll ship anywhere.) In addition to one "wild card" winner, I'll also be picking one of you to win a Wedge on the Ledge! So be sure to let me know in your comment if you'd like to be entered in both drawings, or just the Wild Card. This month's randomly selected Wild Card winner is LacyJ. And the winner of Wedge on the Ledge is D. L. White! Is the penguin the one from Wallace and Gromit? :) Either way, so much awesome! It definitely looks like Feathers McGraw, doesn't it? Those owls! Absolutely gorgeous... I just may have to buy a set for work (circ desk at a library). I work at a library, too. 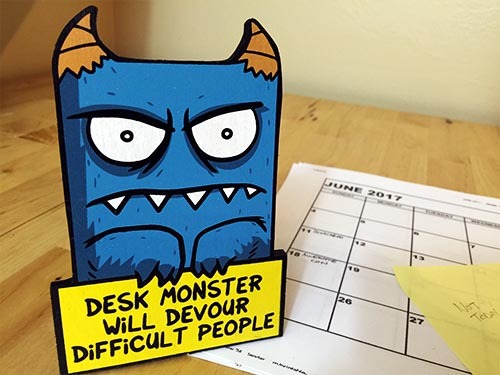 I immediately thought of the Desk Monster for work, but thought it might be inappropriate, no matter how appropriate it actually is. Great picks this month! (Not just this month, I always love your picks.) Can't wait to see the steampunk girl in a coloring book. Yay! Art Roundup time! I love to look at all the pretties. Please enter me in the regular drawing, Jen. I would LOVE the Link and Navi print, it would look great in the room I am decorating in everything Legend of Zelda! Also, the Wedge on the Ledge would be awesome for my classroom! Wedge would be watching the little ones! Those owls are awesome! Please enter me in the wild card drawing. Thank you for doing this every month. I love discovering new art! Those desk monsters make me wish I didn't work from home! (Almost). I'd love to be entered for the wild card art. Merry Christmas! Art is always a welcome gift! Please enter me in both drawings! Thanks! I'd love to be entered for both! Wedge on the Ledge is perfect for my little dorks! Age 5 & 7, so perfect age for creepy elf, but it's just... so... CREEPY! Wedge is so much better! Thank you! I hope the penguin of revenge doesn't visit me. You just made my graduation/birthday/anniversary/Christmas wish list so much longer. I don't have any kids, so no Wedge on the Ledge, but there are so many beautiful pieces on your pinterest board! I'm interested in both drawings, would love to have some of your amazing art stash! Make my entry just for the wild card, please. I must admit I don't even know who Wedge is. Oh my, the little Robin snowman poking out from behind Batman just made me giggle! 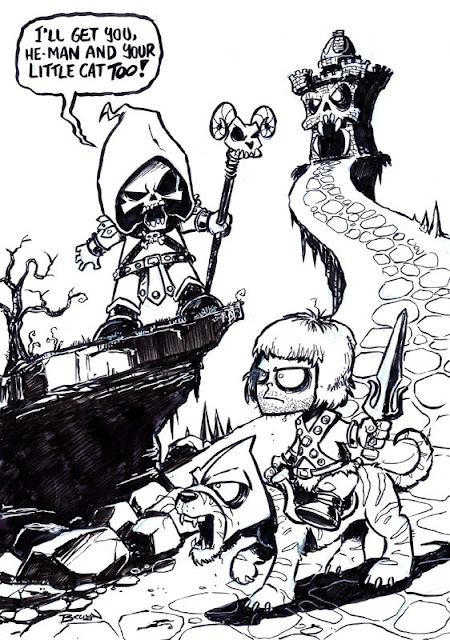 I love the He-Man/Skeletor one too. Fun finds! I would love to be entered in the wildcard drawing, I need some cool geeky art for the nursery I'm currently putting together. Just the wildcard, please! And I love the cards! I'm not much of a commenter (borders too close to being "social") , but I love the stuff you find. Wild card, please & thank you. Thank you Jen!! 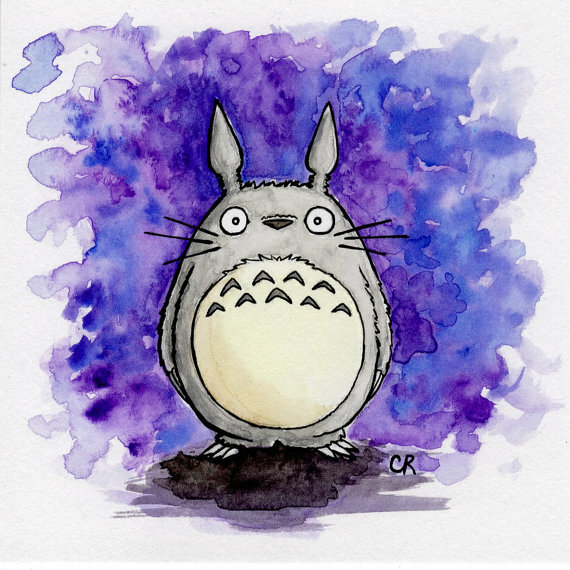 Just bought the Totoro print for my daughter for Christmas...she's nearly 14 and was Totoro for Halloween this year. (I bought her a onsie pajamas/slippers though the slippers arrived after Halloween) I'd love to be entered in both drawings, please. And keep the art coming! I don't often buy, but I love looking at all the artists you feature!! Oh those owls! And that steam punk gal. Swoon. I'd love a chance at the wild card! I'd loooooooove to win something. Art round up is one of my favorite things on the Internet. That bookworm dragon is too cute! Would love to enter the wildcard drawing. As a teacher of middle schoolers, I feel as though having a Desk Monster is a must! Off to check out the website! Enter me in both drawings please! That Batman Snowman just gave me the best idea for a Christmas present for a close friend! Thanks, as always, for posting your finds! Love them. Wedge on a ledge would be very happy in our geeky home. Just sayin'. Beautiful art! And I <3 that there was some new Harry Potter art! I am tempted by so many this month! Oh man! Why you gotta make me choose? 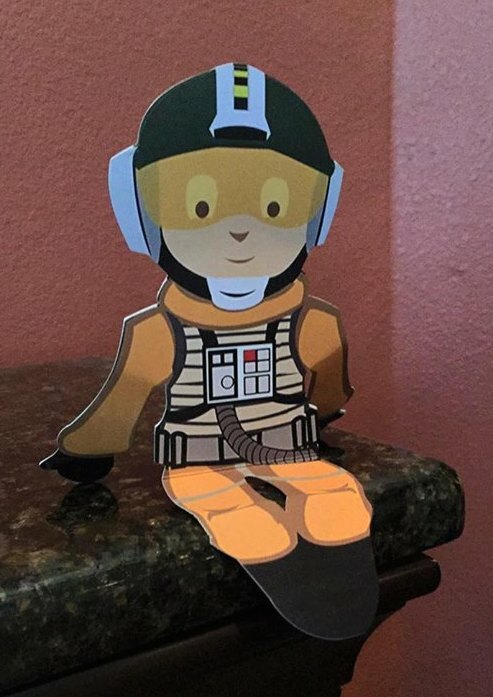 The Wedge on a Ledge would make my Star Wars loving daughter so happy, but the wild card entry would make me happy. Guess we'll have to enter both please. Wow, I love the owl, and the hilarious cards! Great roundup ! Please enter me in both drawings! OMG, everything on here, as per usual, is adorable! I love these. Some year I will convince my husband that we need a geek art wall. This would be a great way to start. But just the wild card, please. 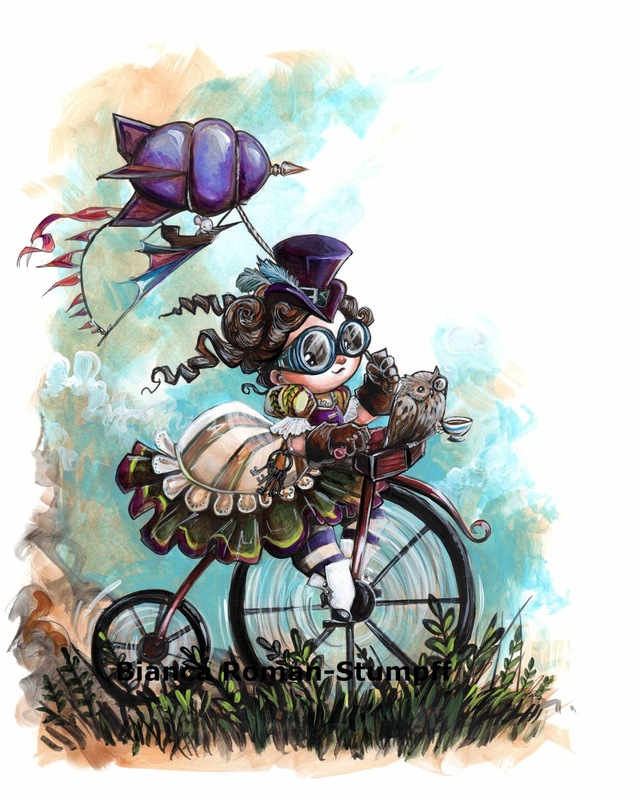 Also love the little Steampunk girl. That owl with the teacup! Beaker and Honeydew is sooo cute!! Those superhero snowmen are just too adorable!! I'd LOVE to be entered into both drawings, please! Ermahgerd I love your taste!! I would love to be entered into the wildcard drawing!! Love the owls! 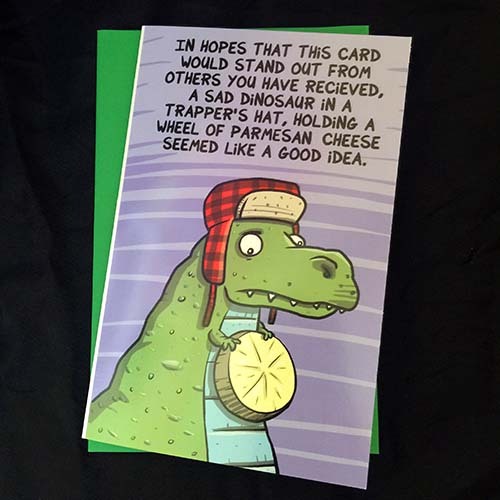 And the dinosaur card. Love the Hogwarts owls! May have to get the Slytherin and Ravenclaw for my daughter (she's probably Slytherin, but we're not exactly sure since those tendencies may just be a function of being 13). Wildcard only, please - let someone else enjoy the fabulous Wedge. Forgot to mention: I'm interested in the Wild Card drawing. Thanks! So much adorable goodness this month! That steampunk girl is so cute, I can't even. I am just loving Bianca's artwork and Craig's Awesome Helmet Club will leave me snickering all day. Thank you for always bringing new artists to entertain and amaze us! These are all amazing! Please enter me into the wild card drawing! Ah! So much cute. Please mark me "entered" for both drawings! So many cute Christmas arts! Wow! Yes please enter me in both. Those holiday cards are hilarious!! And I think I'm in love with the Book Worm Dragon, he's soooo cute!!! I love your finds Jen :D Please enter me for both drawings. I would love to be in the wild-card drawing please! I love these art wrap-ups you do, it gives me so much art to coo over and daydream about! Ah, all so cute! Both drawings please. 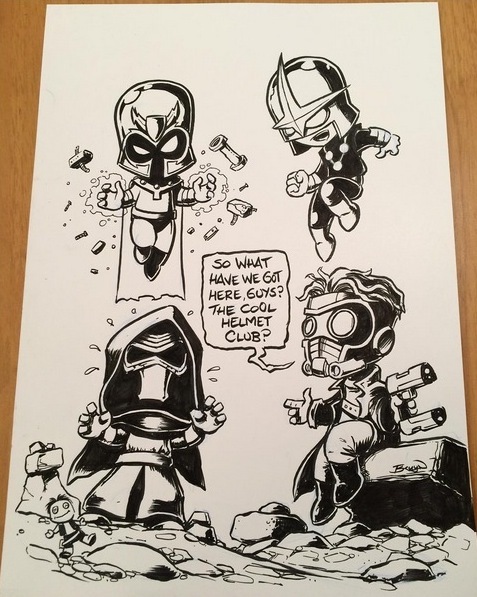 Oh my gosh, look at the teeny Han doll in the "helmet club" drawing!! Squee! Love the helmet club! Pleas enter me in both drawings! SO much adorableness in one place! I can barely stand it. Jen, thanks for your monthly injection of art inspiration, I look forward to this post each month. The cuteness and geekiness all rolled into one awesome post. Thank you!! And yes I didn't know I needed that Wedge. I love that dragon reading. So perfect! Zomg I went into squee overload. If I can through the depressive-motivationless fog, I've got some inspiration starting to bubble. You can also enter me into both drawings, please. These are so cute! I think I need to buy half a dozen Wedge's on Ledge's (is that how you pluralize that?) for all my friends! I'd love to be entered into both drawings! Gah, I think I just found a Christmas present for my Dad: he totally needs that little desk monster! Thank you!! Dad is always the hardest person to buy for. I also love the bookworm dragon and the hero snowmen. You always find the coolest stuff! I'd prefer to just enter the wild card drawing, please. Thanks, as always, for sharing your finds and doing these giveaways. You da best! I am In Love with those owls! Wild Card drawing only, please! As cute as Wedge is, he should go to someone that will love him. You always showcase the best stuff for us, Jen! Love those owls...and the desk monster...and superhero snowmen...and bookworm dragon....okay it's all fabulous!!! Those cards are totally the sort of thing I'd send. No wonder my inlaws think I'm weird. I would like to be entered into both drawings please. The Penguin of Revenge! That's amazing! I'm also a little in love with the owls... Too bad it's Christmas, so no extra money to be had! I'd love to be entered for Wedge, as well! Please toss my name in the electronic hat for a wild card entry! Just a wild card entry please. Wild card pretty pretty please. 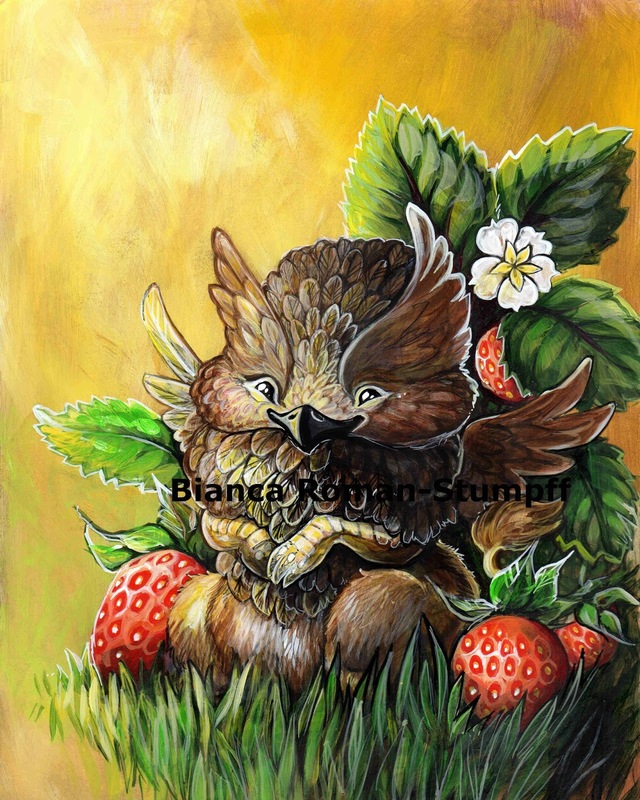 The art of Bianca Roman Stumpff reminds me of my daughter and granddaughter. Oh man, I love the penguin of revenge. Definitely checking out his shop. I'd love either "Harley and Deadpool" or "Beaker & Honeydew". I would love to enter your wild card drawing! Please enter me for both! And I cannot wait to see all the pics from the Christmas tree post! Desk owls are such a necessity!!!! I'm definitely getting a set for my office! 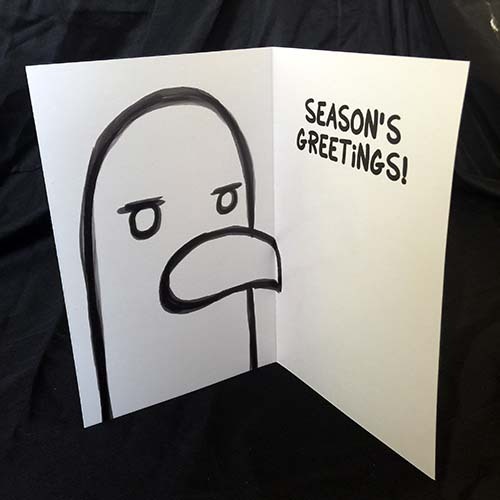 I need to send the penguin of revenge to all of my friends (though it's a shame I've gotten half of my holiday cards done already). And I'd love a Wedge on the Ledge! 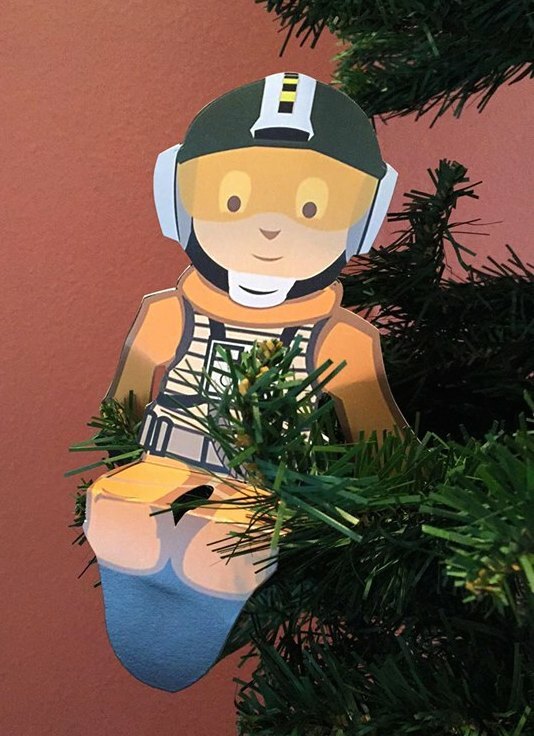 I always thought Elf on the Shelf was kind of creepy, but this can't be creepy; it's Wedge. Just enter me in the wildcard drawing, thanks! I love how you always manage to find such cute art!!! Still lusting hopefully for art nouveau wonder woman. If you could harass Nathan szerdy into opening an online shop, I'd already own it! Where do I start? I think I'll forward this to everyone who asks what I want for Christmas. And I would love either option if I win. 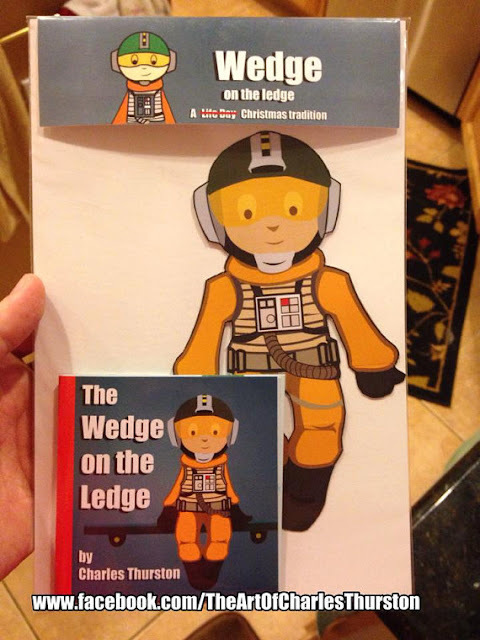 Elf on the shelf is too creepy for me but Wedge on a ledge? Yeah! Enter me as always Jen! Just the wild card one, I'm moving house over the festive period so no new ledge decorations for me juuuuust yet. That Tiki Bird art! Wow!! I'd love to win that, and go in the wild card draw too please! I love your art round ups! Your round ups are how I found out about Bianca and she's now one of my favorite artists. Love that bookworm dragon though! I might need to make another purchase. Fantastic prints! I'm up for both draws! Pretty sure I need to rethink my Christmas shopping lists for people (and myself). Thanks! That only a little sarcastic. :) When you're adding such awesome stuff, you really can't be too mad. 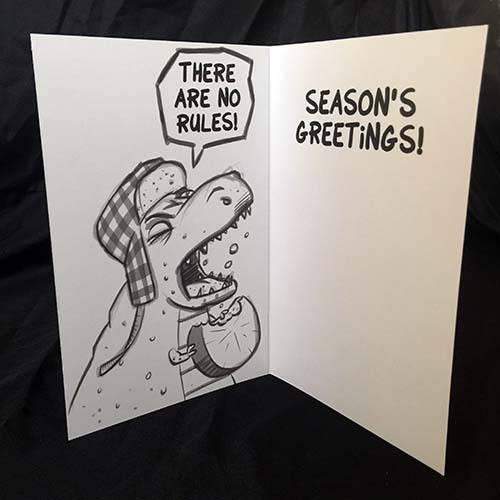 I love those holiday cards! Please enter me for the wildcard! That desk monster! Love it. And those owls!!! They are so adorable! I would like to be entered into both drawings. I have some friends whose geeky kids would love Wedge, so I'd like to be entered for both, please! Art to make the soul happy! aargh! So much love!! I think I'll be ordering those cards! Craig Bruin has a great style. Oh my gosh those owls. I just pinned them so I can buy them for when I move out next fall after I graduate. They'll be perfect for my library/guest room! I would love to be in both drawings please. I love the wedge on the ledge! I feel like this is both perfect and awful for Christmas. I'd love to enter with the wild card pick. Gift ideas, though! I love all of these. The half R2D2 BB8 are a favorite. Also the wild card is welcome if I’m chosen for it. I always need more art! I love Red Rocket Farm, and am so excited that i moved to Atlanta and have seen the art in person at street fairs a few times. That revenge penguin card had me rolling. It is sheer perfection! Also, I loveeee those owls! Tiki Birds and Sea Monsters are still my favorites! And the bookworm dragon is completely adorable too. Your wildcard would be fun to hide around the house. I love the owls! And the snowmen! And everything! Who wouldn't live a Wedge on a Ledge?!?!? Thanks for solving a holiday gift conundrum for me! Desk monster is perfect. I might have to get a hogwarts owl for myself while I'm at it. I am ded from the cute and my wallet will soon be empty. 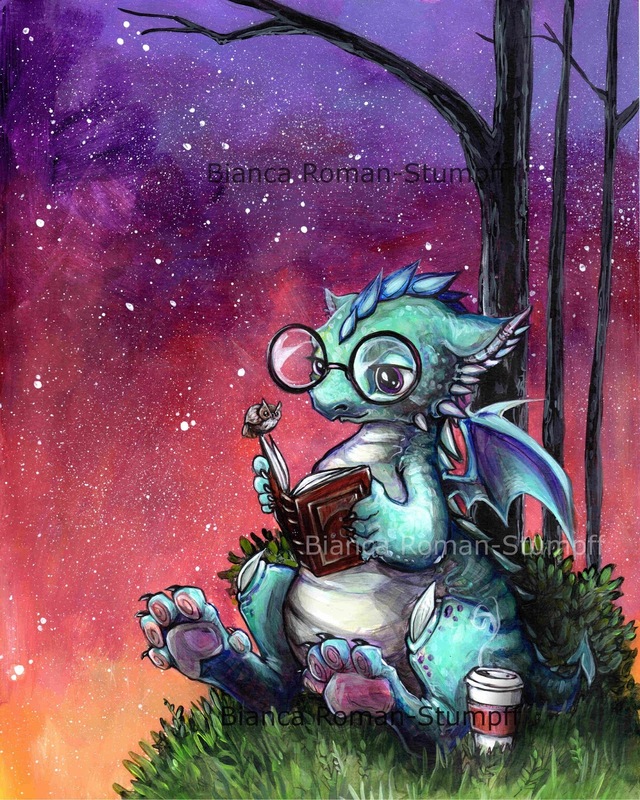 Bookworm dragon needs to be on my wall ASAP. I'd love to enter the wild card drawing! I might have to look into purchasing some of those prints next time I'm in Disney, the postcards by Jerrod Maruyama are adorable! oh man, those owls are the bomb. metaphorically. Thanks for sharing! Awesome, as always! Please enter me in the wildcard! Always look forward to your art round ups. Thank you for this opportunity to win something from your board! I'd love anything you send my way. I think my son would love Wedge on a Ledge, as he's a tiny (4-year-old) Star Wars nerd. I, on the other hand, am a proud Slytherin and would love a house owl!! Ack! Wedge on the Ledge is tooo adorable!! You can enter me for both drawings! I need that bookworm dragon in my life right now. Awww I love the owls and the steampunk little girl. I love the steampunk octupus! That bookworm dragon, so adorable. Another great roundup! So much amazing stuff this month! 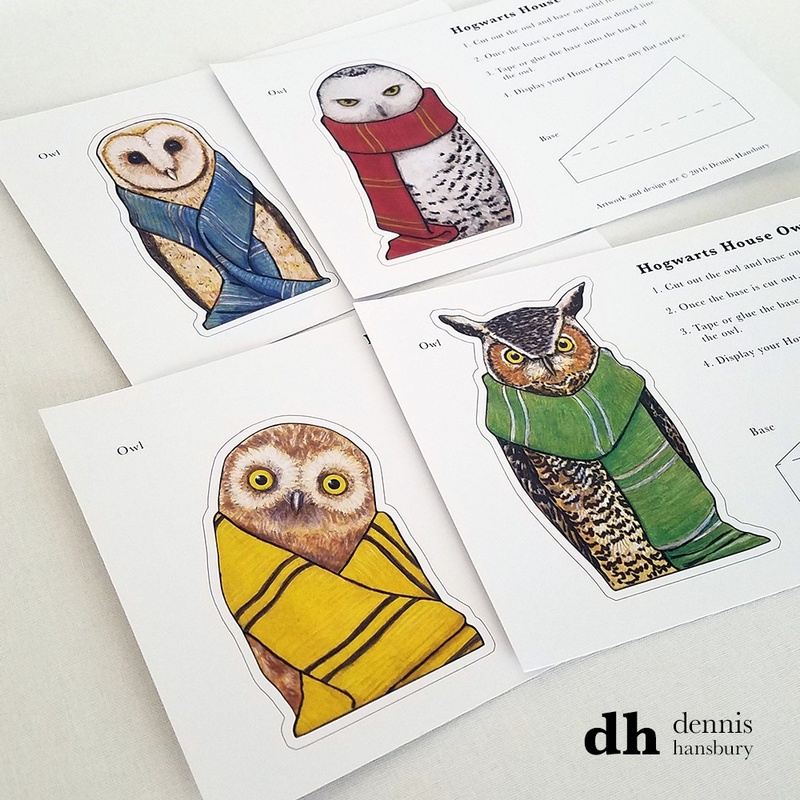 The snowmen, the owls, all the cuteness! Art everywhere! Omigoodness...my Star Wars geek husband would love Wedge on a Ledge. Not to mention you have a bunch of Doctor Who/Tardis prints on your board that I like muchly. Love the penguin card. So funny. I love the Harry Potter owls. Oh my gorsh! 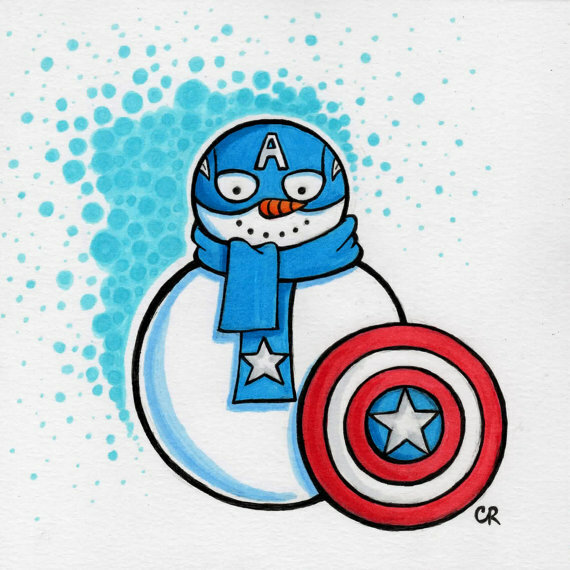 Those superhero snowmen are so stinking cute that I might have to go buy a whole bunch! And I would appreciate being entered in both drawings, if you please! I love the Christmas cards so much! There are no rules -- so great! The desk monster and penguin card are THE BEST. I may have (not so stealthily) showed my BF so I can get them for Christmas. heh. That desk monster is just the bee's knees. 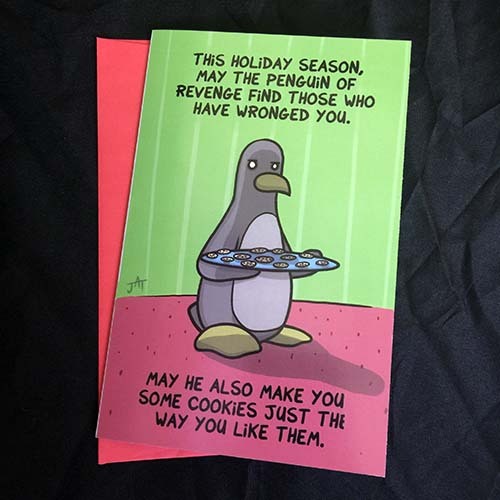 I also think I might need to send that penguin card to a friend of mine who loves both penguins AND cookies. The Totoro and owls are great and I love the R2-BB8 set, the tiki birds and the Maleficent works on your pinterest board. Thanks for sharing such fantastic art every month! I would love to win anything on your board, but most especially the Toothless drawing or the sea creatures. My daughter would go nit's for either one. Love you guys! I meant she would go nuts, lol! The Wedge on the Edge is so cool. The Elf is creepy running to Santa tattling on kids. Love the steampunk gal, snowmen and the totoro! Totally adorable :) I'd love to enter wild card drawing as well! Love "Iron Giant" by Kallie LeFave. I look forward to this post every month. Thank you for continuing to introduce us to new artists! More things to add to my ever-lengthening wish list for when I've got a few spare $$ to spend on art. In the meantime, please enter me for both drawings. Would love to be in the wildcard drawing, so much pretty, awesome, and pretty awesome art. Thank you for sharing such delights. Would love to be entered into both drawings. And OMG, that bookworm dragon! Excellent art round up! Bookworm dragon really spoke to me :) Please enter me in the wildcard drawing! I'm going to have to buy those owls now! Yes please for the wild card entry. Penguin of revenge <3 And yes please for the wild card draw too. Bookworm dragon! If I weren't among people I'd totally be squeezing! I loved the meeting of the cool helmet club. I'd love to be entered in the wild card drawing! Your art board is amazing. Book dragon! 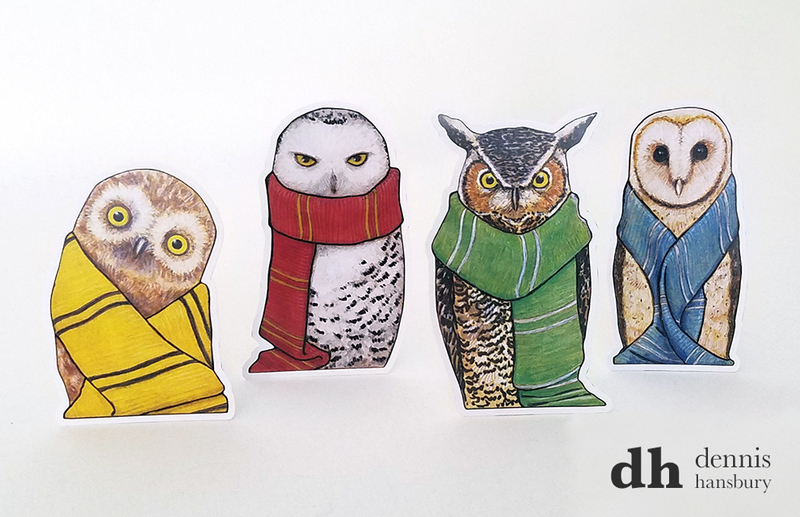 Harry Potter owls! I'm dying over here.